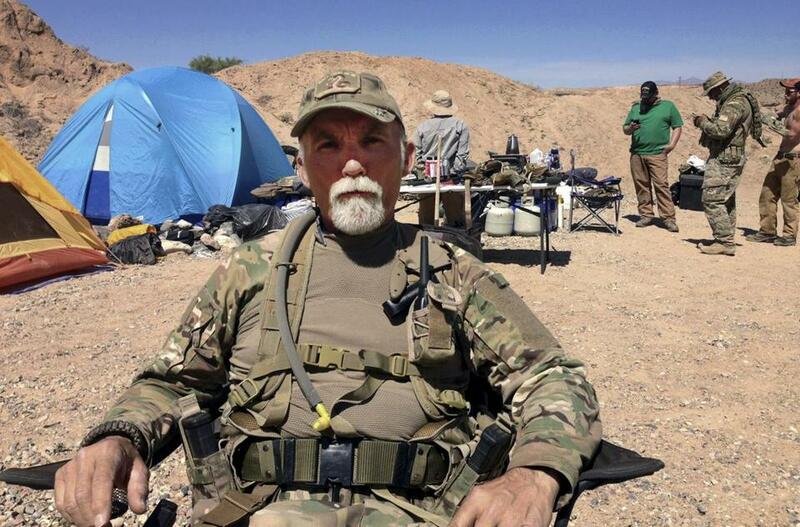 Gerald "Jerry" DeLemus, of Rochester, N.H., sat with a group of self-described militia members at Cliven Bundy&apos;s ranch near Bunkerville, Nev., on April 16, 2014. A New Hampshire man who founded that state’s largest Tea Party group and was a prominent Donald Trump supporter was sentenced Wednesday to seven years in federal prison for his role in the Bundy Ranch standoff against the government in Nevada three years ago. Jerry DeLemus, 62, of Rochester, N.H., is the first person to be sentenced as a result of resisting government officials who acted to move cattle grazing on federally owned land. Others, including members of the Bundy family, have had either mistrials or are awaiting sentencing themselves. The armed confrontation in Bunkerville, Nev., between members of the Bundy family and agents from the US Bureau of Land Management eventually became a conservative cause. Since 1993, the Bundy family refused to pay grazing fees to the government and eventually owed a collective sum of $1 million. In April 2014, when the Bundy family no longer had a permit to graze their cattle on the land, agents moved in to clear the land. The standoff began.Eventually, others, including DeLemus, traveled from across the country to stand with the family against the government. DeLemus served in the Marines, and several pictures showed him armed during the standoff and serving in a leadership role. DeLemus and his wife, Susan, a former two-term New Hampshire state representative, were listed as Trump delegates to the Republican National Convention last year. However, after entering into a plea agreement, DeLemus, who was detained in a federal prison outside of Las Vegas, was unable to go. The sentence from Chief US District Judge Gloria Navarro in Las Vegas was more than a year longer than prosecutors requested. During sentencing, Navarro called DeLemus a “bully vigilante” who had not accepted responsibility for his action. In October, DeLemus tried to withdraw his guilty plea of conspiracy and interstate travel in aid of extortion, but the judge refused and cited his effort to do so as a reason for the longer sentence. “I am a little shocked, and I am sure we will get through this,” Susan DeLemus told reporters about the longer-than-expected sentence. She said she was unsure about the next legal steps, including whether they would appeal. She said her husband was innocent of the charges and only signed the agreement “to take the fall” for others. But after seven others were acquitted from charges in a similar case in Oregon, he tried to withdraw his plea. Former New Hampshire Republican Party chair Jack Kimball, who organized a rally for DeLemus last month, said that there are already discussions underway to pursue a presidential pardon for DeLemus. Kimball said others are asking US Attorney General Jeff Sessions to step into the matter. “I think it is an outrage,” he said. Material from The Associated Press was used in this report. James Pindell can be reached at james.pindell@globe.com. Follow him on Twitter @jamespindell or subscribe to his Ground Game newsletter on politics: http://pages.email.bostonglobe.com/GroundGameSignUp.